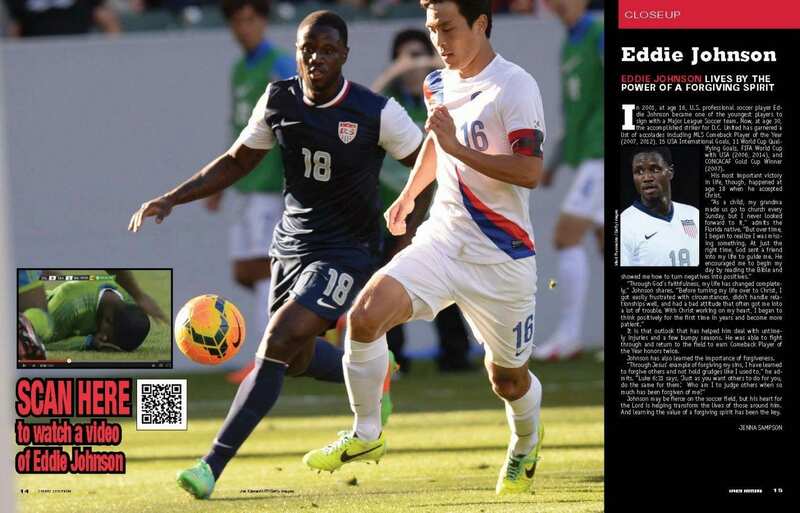 In 2001, at age 16, U.S. professional soccer player Eddie Johnson became one of the youngest players to sign with a Major League Soccer team. Now, at age 30, the accomplished striker for D.C. United has garnered a list of accolades including MLS Comeback Player of the Year (2007, 2012), 15 USA International Goals, 11 World Cup Qualifying Goals, FIFA World Cup with USA (2006, 2014), and CONCACAF Gold Cup Winner (2007). His most important victory in life, though, happened at age 18 when he accepted Christ. It is that outlook that has helped him deal with untimely injuries and a few bumpy seasons. He was able to fight through and return to the field to earn Comeback Player of the Year honors twice. Johnson has also learned the importance of forgiveness. Johnson may be fierce on the soccer field, but his heart for the Lord is helping transform the lives of those around him. And learning the value of a forgiving spirit has been the key.